==> This below method, BTHardCodedClick, produces the expected result. It populates the array accordingly. BUT it is hard coded in creating 4 iTasks and in passing parameters in ProcA. I don't want to implement this way ! ===> The following method is the one I want to implement BUT it is not working !, because it is not populating the array. It seems that only the last iTask " PTasks[indtask]" is being performed. I can't understand why a call to procA(vfirst,vlast,vsize,indtask,varray) inside the iTask is not considering the values of parameters vfirst, vlast. Thanks in advance for your help ! The effect you are observing is due to anonymous method variable capture mechanism. It does not capture variable values at specific point during code execution, but location of the variables. Since all tasks run after the loop where you create them, you will see only the last value stored. To solve your problem you have to add additional function ensuring that you don't capture common variables in your task. Of course, you can also remove your ProcA procedure and incorporate its logic directly inside CreateTask function if that suits your needs. Not the answer you're looking for? 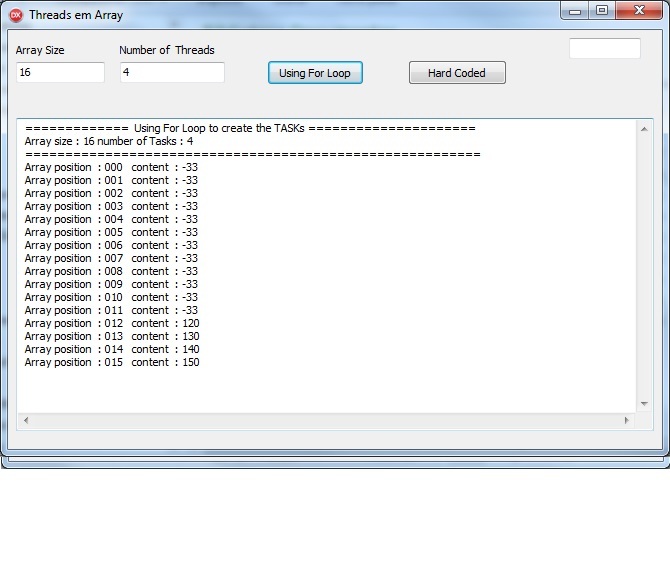 Browse other questions tagged multithreading delphi task or ask your own question. Delphi: how access to the current task index into array of ITask (TTask)? When and how should I use a ThreadLocal variable?